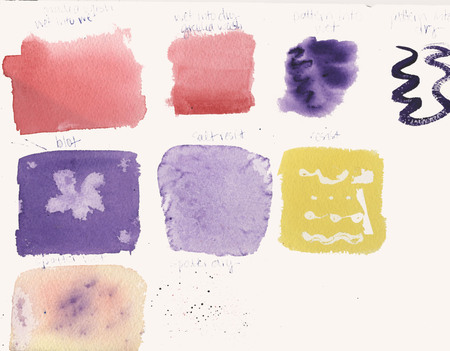 Watercolors...it's what I've really been wanting to try and the class has finally started. 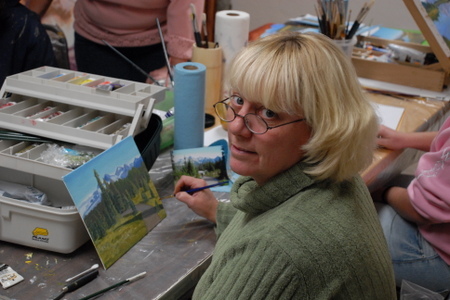 Wanda offers lessons in oils and acrylics every Monday night. You can start anytime and everyone works at their own pace. That's been fun and I've completed 2 paintings, but I think I'll love watercolors more. When we started oil painting lessons last summer, she wasn't offering watercolors but said she thought she'd have a class forming. She likes to start a group of watercolor students at the same time as the techniques are more involved and there is more to learn than in the other mediums. So, today was our first class (of 9 people)! We'll all work learning the techniques together and all paint the same picture before striking out on our own projects. I had a blast today in class using wet and dry paper while working on washes, patterns, blotting, resists, and spatters. The scan is a little funky, but you get the idea :) Gotta get over to Mister Art to order more supplies! John and I started taking art lessons in September. 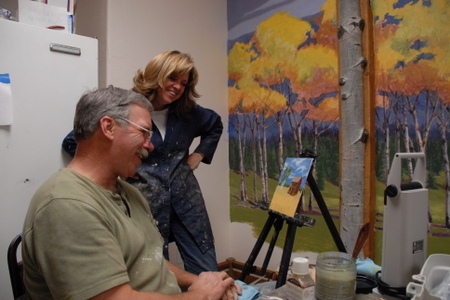 I think I made mention of it in a previous post, but we've finally gotten to a point where there is actually something to see :) Our teacher is Wanda Mumm and she is not only a wonderful artist and painter, but a terrific teacher. She is patient (a fortunate thing for us) and explains things well. She started with the very basics of shadow and composition and she is wonderful at explaining color and how it changes with atmosphere. Our first assignments were to paint our own gray scale (11 shades of gray from white to black), a color wheel, and an atmospheric color chart which taught us how colors change from foreground to background and how to mix colors to get what we need. Wanda moved to Eureka a year ago from Minnesota. I am excited about starting her watercolor class sometime in the next few weeks, as I think that is really the medium I'll most enjoy. We each chose a photo to work from for our first oil painting. I used one from Paradise at Mt. Rainier when we were there with Char, Max, and Nick. John is using one of the old Grave Creek schoolhouse that I took here last fall. We were meeting at Wanda's house, but have now moved downtown to what is soon to be a new coffee and entertainment house! 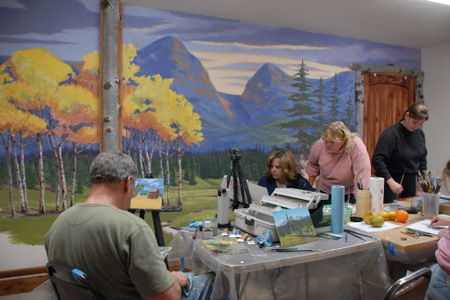 You can see an example of Wanda's painting in the background as she is doing the mural of Thierrault Pass on the wall of our meeting room. We are having a fun time with this!